N4KGL - RaDAR: N4KGL's Plans for the July 14th RaDAR Challenge. The RaDAR Challenge comes with many choices to make involving the venue, the equipment, and the time of day. This July 14th, I plan to go minimalistic. 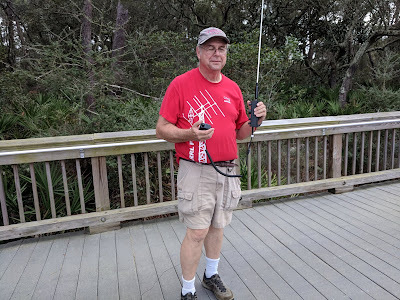 I will use the Elecraft KX2 with an MFJ whip and drag wire counterpoise on the HF bands. The venue will be unusual. I have chosen the Hathaway Bridge over St Andrews Bay in Panama City, FL. Its height above the salt water will be in the order of seventy-five feet. I expect altitude to be advantageous for my 10 watts with a limited antenna. I will also consider the adjacent Carl Gray Park as an additional stop. It is right on the bay. The salt water effect for vertical polarization has been helpful for my portable operating. I should get excellent low angle radiation at the shore or on the bridge. I have had success operating pedestrian mobile with the KX2 at street level and next to the salt water. However, it takes some work and luck to score a contact. The KX2 is literally a handi-talkie for HF, I find the Alex-Mic by PY1AHD is useful. I use a KX2 paddle, but I tap it like a straight key. I will also have a VHF HT with me. Simplex FM contacts count as well. The bridge has some constraints. You cannot stop on the bridge per the posted signs. Therefore, I must keep moving. Per the RaDAR rules, you must move at least one kilometer after five contacts if on foot. However, you also can move while you make the required five contacts, The bridge is not the place to be if a thunderstorm is coming through. That was the case this Saturday and I canceled a practice walk across the bridge I wanted to make. The toughest part of RaDAR on foot in July here in Florida is the temperature and humidity. Therefore, I better start early in the day. A satellite pass opportunity may influence my timing. The first satellite contact is a bonus. I doubt that I try to operate sats from the top of the bridge. I hope to make some RaDAR to RaDAR contacts. Let me know if you will be operating RaDAR. The planning is a big part of the RaDAR Challenge. It is a chance to be creative. Also, weather and other factors may require a plan B. If you try RaDAR have fun making plans and good luck on the event. Be safe!